"We will build our new "STAN" - TOGETHER! А хули, Я могу! - Yes, I can! Аль я не Бывалый Мальчик-Хулиган? President Vladimir Putin has sent condolences after a Russian air strike accidentally killed three Turkish soldiers in northern Syria. The strike hit a building near the town of al-Bab, believing it to contain Islamic State (IS) fighters rather than Turkish troops, Turkey's military said. Eleven others were wounded in the so-called friendly fire incident. They were supporting Syrian rebels who are locked in a fierce battle to try to capture al-Bab from IS fighters. Russia and Turkey, who back opposing sides in the Syrian war, have been jointly conducting air strikes on IS in the town in recent weeks. The Russian aircraft had been planning to hit IS targets but "by accident three of our soldiers were martyred when a building was bombed where our units were," Turkey's military said. The Kremlin has issued a statement (in Russian) saying President Putin had, in a telephone call with his Turkish counterpart, "expressed condolences over a tragic incident which resulted in the deaths of several Turkish troops in the al-Bab area". President Putin told Recep Tayyip Erdogan that poor co-ordination between Moscow and Ankara was to blame for the accident, RIA news agency reports. The two leaders agreed to "increase military co-operation during operations in Syria against IS militants and other extremist organisations". Both countries are conducting a joint investigation, Turkey's military said. The incident comes after a warming of relations between the two countries, which had previously been strained after Turkey downed a Russian jet near the Syrian border two years ago. Earlier on Thursday, Turkish-backed rebel fighters managed to capture the western outskirts of al-Bab, which lies about 30km (20 miles) south of Turkey. Turkish media say 10 Turkish soldiers have been killed in the fighting in recent days. The Dogan news agency says 66 Turkish troops have been killed in Syria since Turkey began its operations there last August to drive out IS, as well as stop the advance of the Kurdish YPG militia - which Turkey considers a terror organisation. At the end of 2015, Russia and Turkey risked military confrontation as the Turkish military shot down a Russian jet which it said had violated its airspace. By the end of 2016, the two, who back opposite sides in the Syrian war, were co-operating to reach a ceasefire in Aleppo. The murder of the Russian ambassador in Ankara didn't derail ties - and nor will today's military accident. Why? Because the two countries need each other. Partly in their general bilateral relations, with Turkey importing most of its energy from Russia and relying on Russian tourists. But partly too in order to achieve their respective aims in Syria. Turkey wants a buffer zone in northern Syria free of IS and the Kurdish militia that it sees as terrorists - and has needed Russian consent for its troops to launch a ground offensive in northern Syria over the past few months. And Russia has managed to prop up the Assad regime and needed Turkey - one of Assad's fiercest opponents - to turn a blind eye to the recapture of Aleppo. Realpolitik has taken the place of steadfast ethics - as it so often does. The Turkish-backed Syrian rebels have been battling IS for al-Bab since late 2016. Syrian government forces, meanwhile, are also closing in on IS from the south, where fierce fighting is reported. Reports suggest the rebels and government forces have reached an accommodation over al-Bab, orchestrated by Syria's key ally, Russia. The two sides are now within 3km of each other on opposite sides of the city. Despite supporting opposing sides, Russia and Turkey have joined forces in recent months to try to end the Syria conflict. They carried out their first joint air strikes on IS targets in the al-Bab area in January, just weeks after securing a ceasefire deal between rebels and government forces that has held in many parts of Syria since the end of last year. In an recent article in Foreign Policy magazine, author Trita Parsi wants us to believe that “Iran’s proxy wars [are] a figment of America’s imagination.” He brushes off the statements of newly minted Secretary of Defense James Mattis—a career Marine, four star general and universally lauded military expert—as hyperbole. Interestingly, Parsi neglects to mention Iran’s long-held position as the leading state sponsor of terrorism. At a time when facts are at a premium, let's assess the stark realities of the Iranian regime and the severe threat it poses to global security. Iran is responsible for the death of more than 1,000 U.S. service members, and the catastrophic injuries of countless more through its financial support, provision of weapons and training of terrorists in Iraq, Lebanon and across the Gulf states. A July 2012 U.S. court case confirmed Iran’s integral role in the 1983 Hezbollah bombing of the Marine barracks in Beirut; the deadliest attack against Americans before 9/11, this truck bombing killed 241 Americans. This support has continued for decades. Following the 2003 U.S. invasion of Iraq, Iran supported, trained, and funded Shi’ite insurgents to target American troops, supplying them with deadly Improvised Explosive Devices (IEDs), the top killer of U.S. troops in Iraq. In the wake of the nuclear deal, the Iranian economy has benefitted greatly from lifted sanctions. Unfortunately, recent reporting confirms that the biggest benefactor has not been the Iranian people but instead is the Iranian government, which is still controlled by the Ayatollah and the Islamic Revolutionary Guard Corps (IRGC), a terrorist organization sanctioned by the U.S. and international community. This infusion of cash, since the lifting of sanctions, has only further enabled and emboldened Iran in its hegemonic efforts. Reuters reports that “for the first time, Tehran could exert authority over a vast sweep of the Middle East” and gain the upper hand over its Sunni rivals. Further proof comes in the form of reports that in recent months Iran has increased the pace of weapons transfers to the Houthis in Yemen. In October alone, the U.S. seized five weapons shipments at sea bound for Yemen from Iran. The U.S. military believes Iran supplied the cruise missiles the Houthis fired at U.S. naval vessels off the coast of Yemen that month in an unprecedented escalation of the conflict. There is no shortage of examples or evidence, no lack of statements from leading government officials. Iran is unabashedly encouraging proxy wars throughout the Middle East. And the current nuclear deal provides a terrorism slush fund to increase those actions. Rather than attempt to deny the Iranian regime’s transparent role in waging destructive proxy wars across the Middle East, or cast blame on other Gulf states, we must accept the facts and recommit ourselves to fight all terrorists and those who would support them. Matan Shamir is the executive Director at United Against Nuclear Iran (UANI). Looking out from Israeli-held territory, the scrubby and rock-strewn ground pitches steeply downwards towards a patrol road and the border fence. The current frontier with Syria - the young lieutenant points out - is about a third of the way up the opposite escarpment. And just a couple of kilometres beyond that is another ridge, which is Jordan. This is Israel's front line with Syria. The Syrian army was evicted from the Golan Heights when Israeli forces captured it in the 1967 Middle East war. Israeli law was extended there in 1981 - effectively annexing this crucial strategic high ground. It is now a heavily fortified area. We pull up alongside a platoon of Merkava tanks, key sensors and weaponry shrouded in tarpaulin covers against the winter damp. Once things were fairly simple here. Israel faced the Syrian army across the ceasefire demarcation lines, monitored by UN observers. But there was almost no need for them. This was Israel's most peaceful frontier since 1973. But the civil wars in Syria and the collapse of Syrian government control in many areas have changed all that. The geography here is not the only thing that is complicated. The war in Syria has altered the strategic map as well. Opposite the southern Golan the ground is held by a local force - the Yarmouk Martyr's Brigade - which owes its allegiance to so-called Islamic State. Israeli troops see its fighters exercising and monitoring their positions, but there is rarely trouble. What alarms Israel most is what is happening further north, with the victory of Syrian government forces backed by Iran and Tehran's ally, the Lebanese Shia militia group, Hezbollah. Professor Asher Susser, a senior fellow at the Center for Middle Eastern Studies at Tel Aviv University, summed it up in one sentence. "The changes in Syria," he told me, "have brought Iran closer to Israel's borders than ever." He told me that at least in theory it creates "the possibility of Iranian-Hezbollah co-operation not only along the border between Israel and Lebanon but along the border between Israel and Syria as well". In his view there is "a dangerous potential for a long border from the Mediterranean, across Lebanon and Syria, with Hezbollah and Iran at very close quarters with Israel. "Israel," he stressed, "has never faced that kind of situation on its northern border before." So what exactly is Tehran's goal in Syria? For an answer I turned to Ehud Yaari, veteran Middle East commentator for Israel's Channel 2 Television News. "The strategic objective of the Iranians today," he told me, "is to establish a land corridor between Iran and Hezbollah in Lebanon; to reach the Mediterranean and the Israeli frontier." This land corridor, he explained would go "from Iran via the Shia regions of Iraq, through the western Iraqi desert, linking up with Assad and Hezbollah. "This," he stressed, "is strategically the major threat to Israel today". Iran of course is not the only foreign country involved in the fighting in Syria. Russian air power - along with Hezbollah fighters and other Shia militias on the ground - played a decisive role in propping up the Assad regime. Russia has twice announced the scaling down of its military deployments, but actually shows every sign of being in Syria to stay. The presence of Russian aircraft and especially long-range radars and air defence missiles greatly complicates the threat environment facing the Israeli air force. It has struck at arms shipments going from the Syrians to Hezbollah on several occasions, having set a "red line" that rejects the transfer of sophisticated missile systems to the Shia militia. Ehud Yaari told me that the presence of the Russians has not significantly affected the Israeli Air Force's freedom of action over southern Syria. "There is an understanding," he explains, "a sort of a hotline between Israel and Russia where a Russian-speaking Israeli Air Force officer and a Russian officer in Syria are co-ordinating and making sure that you don't have any mishaps." This arrangement, he insists, is working and this is fundamentally because the Russians' strategic interests and those of Iran are very different. Mr Yaari says that the Russians are not very interested in protecting Hezbollah arms shipments or the security situation south of Damascus, close to the Israeli border. How big a threat is all of this to Israel? A series of military briefings suggests that Hezbollah and its growing armament is seen as perhaps the primary challenge to Israel's security. Hezbollah, due to its training and equipment, is now viewed as a fully-fledged army rather than a semi-amateur militia. "It has lost heavily in the Syrian fighting but it has also gained invaluable combat experience," a brigadier told me. It has established a well-entrenched infrastructure in southern Lebanon with a huge arsenal of missiles of varying ranges. The fear among Israeli military experts is that under Iranian tutelage it might seek to establish a similar platform for operations in Syria as well. There is a precedent here as Ehud Yaari explains. "The major concern now is that the Syrian regime will be able to negotiate deals with the different factions of the rebels in the southern region of Syria so that they withdraw from border areas. "This," he says, "is exactly what happened in other areas of Syria, especially in the countryside around Damascus." Such a move could open the way to the entrenchment of Hezbollah, Iranian Revolutionary Guards or other Shia militias sponsored by Iran in the south. At present this is more a potential rather than an actual threat. Professor Asher Susser told me that, in the long-run, much depends upon how the Russians play the game of regional alliances. "If the Russians and the Turks are on one side of the equation and the Iranians on the other," he told me, "that may put a limit on what it is that the Iranians can achieve." This is why he believes that Israel's contacts with Moscow are so important. "This," he told me, "is a relationship that Israel's Prime Minister Benjamin Netanyahu has reinforced over the last year or two. "Mr Putin and the Russians," he says, "have an understanding of Israel's strategic needs which, if they take them into consideration, may put a brake on this Iranian-Syrian project." Nobody knows when or how the fighting in Syria will end. Several Israeli experts I spoke to hope for some kind of regional deal that might constrain the freedom of movement of Iranian-backed militias in Syria. But agreement or not, the new actors on Israel's frontiers present a new and more complicated set of challenges. Russian Ambassador to Israel, Alexander Shane, said that his country is working to prevent the transfer of Russian weapons to Hezbollah. During an interview with the Interfax news agency, Shane noted that Israel presented Moscow with its "red lines" and shared concerns about Russia's cooperation with Iran and Syria. According to Shane, Israel presented red lines to the Russians about events in Syria, the most important of which were the transfer of modern, advanced weapons to Hezbollah and the establishment of an anti-Israel base with Iran in the Syrian Golan. 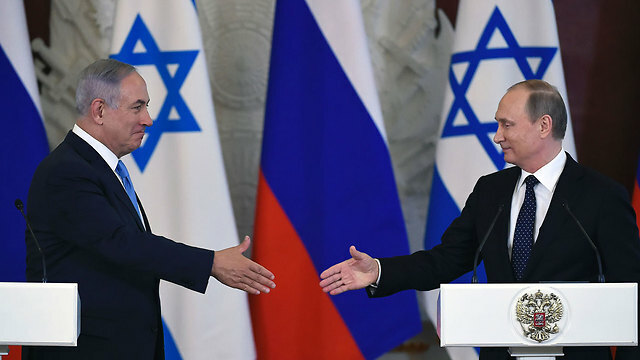 "Russia explained to Israel how it thinks the crisis in Syria can be solved in order to unite all forces in the war against terrorist groups and establish a steady future for Syria by Syrians themselves," said Shane. Shane added that Israel understands was his country is doing in Syria, "but for them, the best thing that can happen is cooperation between Russia and the United States—and not Russia and Iran—to solve the crisis in Syria and the fight against terrorism in the Middle East." According to Shane, "Israel sees Iran as the biggest threat and cause of instability in the region." 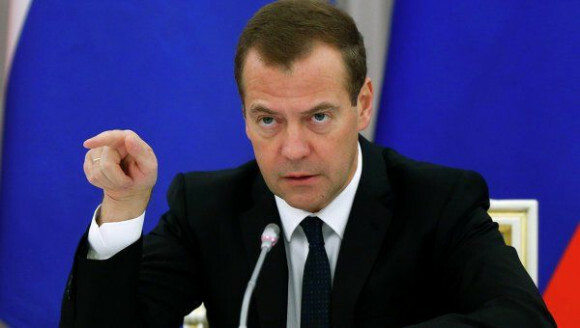 he added that "Russia promised Israel that Russian weapons will not make it to Hezbollah. Israel wants a deal between Russia and the United States to end the war in Syria." A Wall Street Journal report claimed that the Trump administration is trying to find ways to break up the military and diplomatic pact between Russia and Iran. The report relied on the words of a senior official in the administration as well as statements from European and Arab officials who are involved in the matter. "If we can drive a wedge between Russia and Iran, it’s an option we have to check," said that same American official. According to the same Wall Street Journal report, the White House has no illusions about Russia and does not think President Vladimir Putin is a "choir boy." However, the real question, according to European officials, is what Putin will demand from Trump in return for weakening his alliance with Tehran. Сообщение: Финансовая система мира устарела - к такому выводу пришли участники саммита, который завершился в Пекине в минувшую субботу. Nov 21, 2013 - «Комсомолка» заглянула на сайт госзакупок и порадовалась за целый город, фонтан, танцоров и высокопоставленных чиновников. «Это пока наше, скажем по-честному, слабое место, потому что мы научились создавать такие производства, но, чего скрывать, значительная часть оборудования здесь иностранное, но есть наше», — сказал Медведев в ходе посещения Кировского машиностроительного предприятия (входит в концерн ВКО «Алмаз — Антей»). Он отметил, что уже есть станки, которые в России начинают собирать в кооперации. «Вы знаете, мы в Ульяновске открыли производство высокотехнологичных станков. Но нам обязательно надо вернуться к тому, что раньше называлась индустрия средств производства», — сказал Медведев. «Нужно обязательно в эту сферу вернуться и обязательно начать и лицензионное производство, и собственное производство», — добавил премьер. По его словам, Россия сейчас находится «в сложном положении». «Нам объявили, по сути, торговую войну, обложили санкциями в расчете на то, что вот если они все это позабирают, то у нас таких производств, как ваше (Кировское машиностроительное предприятие. — RNS), оборонных просто не будет. В этом цель тех государств, которые подобные санкции вводят», — сказал Медведев. По словам Медведева, на сегодняшний день финансовые вложения не завышены. «Но надеюсь, что с каждым годом будем увеличивать вложения в эту сферу (высокотехнологичного станкостроения. — RNS)», - добавил премьер. Diplomatic activism by Russia in Syria is producing speculation about the Kremlin’s possible willingness to encourage genuine peace talks and spur transition from corrupt, incompetent and brutal family rule toward something stabilizing and inclusive. If Russia proves genuinely interested in converting military success to a sustainable political settlement, it would put Moscow sharply at odds with Iran and with the regime of Syrian President Bashar Assad. Is Russian President Vladimir Putin truly prepared to turn a page in Syria? The litmus test will be Moscow’s view of whether or not Assad rule should be restored to areas eventually liberated from the Islamic State group..
Russian air power and Iranian-led Shia foreign fighters saved Assad from military defeat. Intervening militarily in Syria allowed Putin to tell his countrymen that Russia was back as a great power; that Russia had thwarted a purported American regime-change campaign in Syria. Iran, on the other hand, has supported Assad because Assad alone, in a nationalistic Syria, is willing to be Iran’s servant on all matters having to do with Lebanon’s Hezbollah: the terrorist long arm of Iranian penetration into the Arab world. Having saved Assad and all but declared military victory, Russia may be asking itself now if Assad is a liability for its longer-term interests in Syria. It would be an apt question. The Kremlin is aware of the regime’s shortcomings. Russia knows that a stable Syria — a place where it would be possible to have secure military bases and a strong, beneficial trade and defense relationship — is unattainable with Assad at the helm. When it comes to reconciliation and reconstruction, the name "Assad" is pure poison in Syria and far beyond. The Syrian equivalent of North Korea headed by a mass murderer may not be something Russia seeks as a long-term client. Hypothetically, therefore, Russia might be interested in a political transition formula that gradually marginalizes Assad and vests executive power in a national unity government. Iran, however, would have no such interest. Tehran knows that, beyond the Assad family and entourage, there is no Syrian constituency accepting subordination to Iran and putting the Syrian state at the disposal of a Lebanese terror organization. Well-informed Syrian opposition figures say they are hearing from Russians that they are disgusted with the undisciplined, looting Shia militiamen brought by Iran to Syria. These Shia militias — including Hezbollah — advance Iran’s sectarian agenda and incite Sunni Islamist extremist backlash. They are kerosene on a fire Russia says it wants to extinguish. Opposition representatives also claim to be finding Russian interest in helping them separate nationalist rebel forces from al-Qaida’s Jabhat Fatah al-Sham, the former Nusra Front. The prerequisite for separation is a real cease-fire. When the nationalists and extremists are all under fire from Assad and Iran, they have no choice but to stick together. Enabling separation and the ultimate destruction of al-Qaida therefore requires Russia to keep a tight leash on the Assad regime and the Shia militias. But the regime and Iran — contrary to Russia — want to target as terrorists all anti-Assad rebels: even the ones Moscow recently invited to Astana, Kazakhstan, to discuss peace. So: Russia and Iran may have conflicting views about the future of Assad. But do they really? Would Russia actually be willing and able to neutralize Iran’s toxic presence in Syria by getting the Shia militias out and then marginalize the polarizing Assad clique? If Russia is able and willing to do so, clearly it would be for its own interests: a stable, unified Syria closely aligned with Moscow; a place that can attract the reconstruction investment and assistance so sorely needed. What Putin might want from Washington is a commitment to assist with reconstruction once decent, non-Assad governance is in place. Otherwise, if Putin calculates that the Assad-Iran page must be turned for the interests of Russia, then clearly there is need for a geopolitical inducement from Washington. Naturally, Assad and his Iranian masters will push back if Russia sees them as obstacles to the kind of Syria that Moscow wants. The Kremlin’s ability to sideline the twin destroyers of the Syrian state may be limited. But does Russia even want to do it? Central and eastern Syria will likely provide the answer. The United States aims to liberate these areas from the other side of Syria’s terrorist coin: ISIS. If Russia calls for Assad rule to be restored in areas liberated from ISIS — if Moscow wishes to reimpose the governance malpractice that made Syria safe for ISIS in the first place — then clearly it wants Assad and Iran in the Syrian saddle indefinitely, regardless of the consequences. Speculation about Russia and Iran splitting over Assad is interesting. The truth will be found in Moscow’s view of what should follow ISIS. Washington is free now to elicit that view and answer the question. 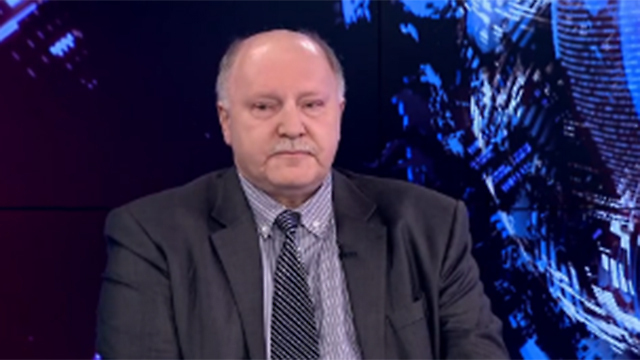 Frederic C. Hof, director at the Atlantic Council’s Rafik Hariri Center for the Middle East, served as a special adviser for transition in Syria at the State Department in 2012. (TASS) The Russian Aerospace Forces will use Iran’s military infrastructure for operations against terrorists in Syria if Moscow and Tehran deem it necessary, Russian ambassador in the Islamic Republic Levan Dzhagaryan said in an interview with TASS. “If the leadership of the two countries will consider it necessary to use the Iranian military infrastructure to combat terrorism in Syria or elsewhere, such steps will be taken,” the diplomat said. In August 2016 Russian military used Shahid Nojed airbase in Iran to deliver airstrikes on terrorists in Syria. In December Iran’s Defense Minister Hossein Dehghan said Terhan was ready to consider Russia’s request on the use of the airbase but no talks on the issue were underway. Dzhagaryan said the reports of Russia’s alleged plans to deliver S-400 antiaircraft missile systems to Iran are inconsistent with reality. “Periodically appearing media reports about the possible delivery of S-400 complexes have nothing to do with reality,” he said. By now, Moscow has fully closed a contract for the delivery of S-300 complexes to Iran, the Russian diplomat said. “Last year, Russia finished completely the fulfillment of its obligations for the delivery of S-300 air defense systems to Iran,” the ambassador said. Iran takes interest in many Russian projects in the sphere of military-technical cooperation, including Sukhoi-27, Dzhagarian told TASS in an interview. “It is common knowledge that the Russian aerobatic demonstration team Russian Knights (flying Sukhoi-27 jets) participated in the Iran Airshow-2016 on Kish island last November,” Dzhagarian said. 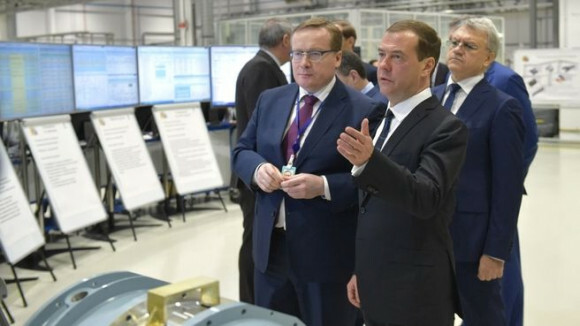 He recalled that Iran’s Defense Minister Hossein Dehghan and a number of Iranian defense-industrial complex officials were able to see for themselves the capabilities of Russian planes. “Hossein Dehghan also visited a static exhibition of Sukhoi-27 fighter jets,” the ambassador said. According to Fox News, Iran launched a Mersad surface-to-air missile from the Semnan launch site Feb. 8 in its third missile test since U.S. President Donald Trump took office. Iranian Defense Minister Hossein Dehghan denies the allegations. Regardless, it is odd that such an event is garnering attention at all. It is extremely common for countries to test surface-to-air missiles: The United States and other major military powers test similar missiles almost daily. It seems that U.S. media outlets may have confused concern over another planned launch with the one on Feb. 8. Iran had been planning to launch what U.S. officials believed was a Safir rocket — a 2-stage expendable launch vehicle modeled off the Shahab ballistic missile family — from the Semnan launch facility, likely over the weekend in celebration of the 38th anniversary of the Iranian Revolution. But there were indications earlier this week that the mission had been cancelled, perhaps in an effort to contain tension between Iran and the United States. It is also probable that there are technical reasons for scrubbing the launch. Iran has tested only a few Safir rockets, the last in 2015, and is still perfecting its rocket launch technology. And it will, in fact, be perfected. Ballistic missiles are essentially sub-orbital flights of expendable launch vehicles and much of the technology is transferrable from one to the other, particularly when it comes to the rocket engine and navigational and related technologies. The launch of the Mersad missile is of much less concern to the United States. It's an old air defense system that Tehran has been routinely testing in central Iran to develop a longer range variant. 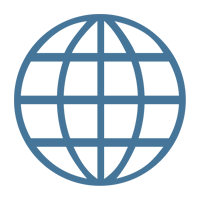 The United States is not likely to pay much attention to it, especially since Washington did not rise up over two other tests last weekend. It is also worth noting that the launches have been decreasingly provocative. The first launch, which failed, was of a medium range ballistic missile and provoked U.S. sanctions. The second test was a series of launches of three different short-range missiles (ranging from 60 to 75 kilometers). It was part of a war games test that was announced before the ballistic missile test so was likely not intended as retaliation for the sanctions. The third test was of the Mersad system, which is of little import to Washington. So, whether the United States responds or not, Iran will continue to develop its missile program. The question is whether it does so offensively or defensively. US sanctions on Iran may lead to an oil price rally in 2017, according to economists at RBC Capital Markets. The escalation in provocative Iranian military maneuvers could be the catalyst for US President Donald Trump to refuse to give Iran a positive quarterly certification – a requirement for the continued waiver of US congressional energy sanctions, they said. Sanctions against the third-largest producer among the OPEC, Organization of the Petroleum Exporting Countries, will penalise foreign energy companies operating in Iran as well as countries that import crude from the nation. That could potentially take out a large part of the Iranian oil from the market and reduced supply could lead to a price rally. RBC’s note comes as three key OPEC countries, Iraq, Iran and Libya, are included in the Trump administration’s new immigration policies with different implications for oil. The three together produce almost 9 million barrels of crude a day. In Iraq, the operations of US oil companies and energy firms could be affected if Iraq’s parliamentary measure calling for reciprocal restrictions on US nationals entering the country becomes law. There is a far less oil risk in Libya, but there could be a broader shift in US policy towards the country. While Saudi Arabia was not included, there are other issues of concern, namely a possible tax on US energy imports, RBC said. Any sanctions on Iran would have an impact in the second half of the year, RBC said. If Iran were to cut its production in response to waning demand due to the sanctions, other OPEC members may seek to make up the difference through a partial reversal of cuts proposed in November, thus maintaining output, it said. While large importers of Iranian crude such as India and Turkey largely went along with US sanctions previously, it is far from certain that they would toe the line should the sanctions be reapplied, RBC said. India recently displaced China as the biggest importer of Iranian crude and South Korea has also stepped up Iranian oil imports. Crude traded at US$53.8 a barrel and is headed for a third weekly gain on estimates that OPEC has reached about 60 percent of its output-cut target. Hundreds of thousands of Iranians rallied across Iran on Friday to swear allegiance to the clerical establishment following U.S. President Donald Trump's warning that he had put the Islamic Republic 'on notice'. 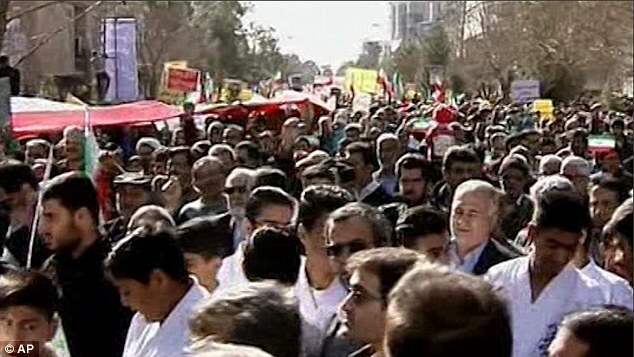 Hundreds of thousands of Iranians have rallied across Iran today carrying effigies of US President Donald Trump and chanting 'Death to America'. 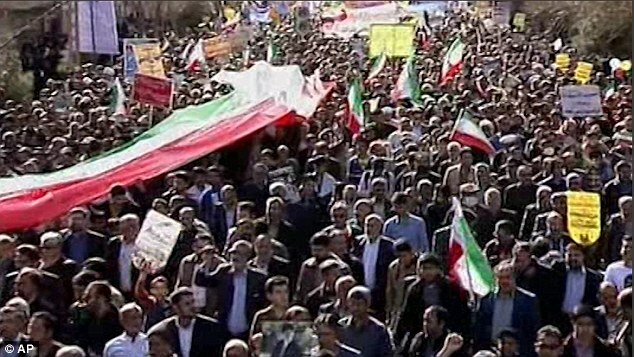 The huge crowds responded to a call from Supreme Leader Ayatollah Ali Khamenei, who called on citizens to demonstrate that Iran is not frightened of American 'threats'. Trump declared that he has put the Islamic Republic 'on notice' and Iran is one of seven countries on the administration's 'travel ban' list, which is being challenged in US courts. 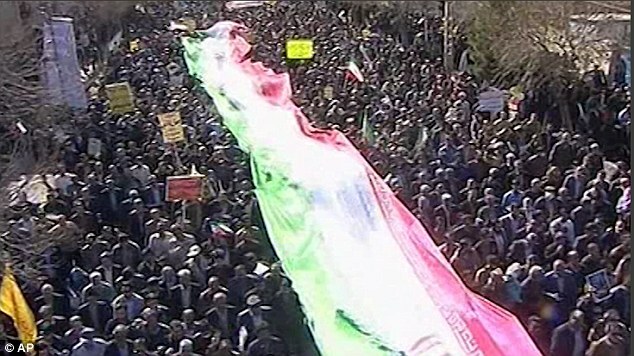 Demonstrators in Tehran marched towards the Azadi ( Freedom) Square to commemorate the anniversary of Iran's 1979 Islamic Revolution that toppled the US-backed shah. 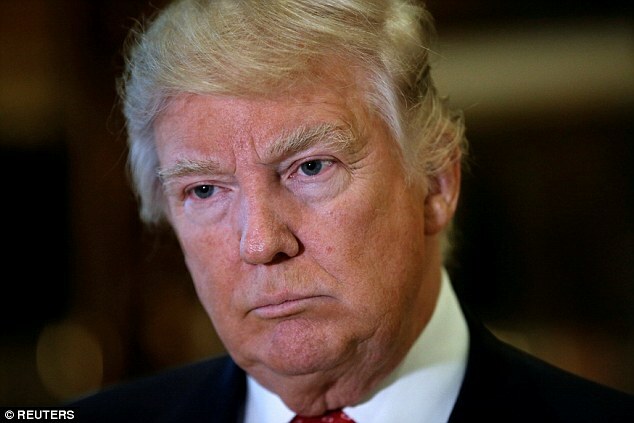 Trump reacted angrily to an Iranian missile test on January 29 and imposed fresh sanctions on individuals and entities. Iran said it will not halt its missile programme. The rally marks the 38th anniversary of the Iranian Revolution, which saw the overthrow of the US-backed Shah Mohammad Reza Pahlavi. The Pahlavi dynasty was replaced by the Grand Ayatollah Ruhollah Khomeini following a lengthy civil resistance campaign, dating back to October 1977. The Shah went into exile in January 1979, and on February 11 guerillas and rebel troops overwhelmed soldiers loyal to the Shah. Khomeini became the country's Supreme Leader, a position which was created in the Islamic Republic's constitution, making him the highest-ranking politican and religious authority in the country. He was succeeded by Ayatollah Ali Khamenei after his death in 1989. Pragmatist President Hassan Rouhani also called on Iranians to join the rally on Friday to 'show their unbreakable ties with the Supreme Leader and the Islamic Republic'. State television said millions turned out nationwide at revolution rallies in all main cities marked by the traditional anti-US and anti-Israel slogans and the burning of US flags. On social media, like Twitter and Facebook, many Iranians used the hashtag of #LoveBeyondFlags, urging an end to flag-burning during the anniversary. They also thanked Americans for opposing Trump's executive order banning travelers from seven mainly Muslim countries, including Iran. Trump's travel ban is being challenged in US courts. Both US-based social media sites are blocked in Iran by a wide-reaching government censor but they are still commonly used by millions of Iranians who use special software to get around the restrictions. Iranian officials, including Khamenei, have Twitter and Facebook accounts despite the ban. Trump has criticised a nuclear deal reached between Iran, the United States and other major powers in 2015 aimed at curbing the country's nuclear work. Most of the sanctions imposed on Iran were lifted last year under the deal. Here are the top stories for Thursday, February 9th: Trump summons senators for pitch for Gorsuch; Powerful snowstorm pummels northeast; Sessions sworn in as Attorney General; and an orange alligator on the loose in South Carolina. The nation's former spy chief said he worries the Trump administration's recent travel ban targeting citizens from seven majority-Muslim countries is damaging to US interests and that he's not aware of any intelligence necessitating the ban. In executive actions, President Trump vows crackdown on violent crime. Is America as unsafe as he thinks? President Trump signed three executive actions Thursday designed to crack down on violence in America, directing the Department of Justice to form a task force and take other steps to target criminal gangs and reduce violent crime and crime against police. But Trump has, in the past, misstated crime statistics or not presented them in the proper context, presenting a somewhat bleaker view than perhaps is warranted. He has accurately cited a statistic from the Brennan Center for Justice, which found that, in the largest 30 cities, homicides increased by 14 percent from 2015 to 2016. But in that data set, one outlier city — Chicago — was responsible for 43.7 percent of the total increase in homicide rates in 2016. The latest FBI data show a more than 10 percent increase in murder and non-negligent manslaughter from 2014 to 2015. But the murder rate is down even from as recently as 2009, and it has been declining — with a few upward blips — since the height of the crack epidemic in the early 1990s. Nonetheless, Sessions said in his own remarks that America had “a crime problem,” and it was no mere anomaly. Sessions mentioned violent crime in his remarks even before terrorism, indicating just how high a priority it might become in his Justice Department. Trump issued executive orders on three topics — gangs, violent crime in general, and violence against police particularly. They contained mostly broad directives, which Sessions presumably will be left to implement. On crime in general, Trump ordered the creation of a task force to study existing laws and crime data collection and “develop strategies to reduce crime.” The task force is to submit a report to him within a year. On gangs, he ordered beefed up enforcement and the issuance of once quarterly public reports “detailing convictions in the United States relating to transnational criminal organizations and their subsidiaries” He asked for a broader progress report for himself in 120 days. On violence against police, Trump ordered prosecutors to develop a strategy to use existing laws to prosecute those who harm law enforcement officers and to “review existing Federal laws to determine whether those laws are adequate to address the protection” of police. According to the National Law Enforcement Officers Memorial Fund, there were 135 officers killed in 2016, up from 123 the year before, and 64 were shot and killed, up from 41 the year before. Trump has cast himself as a pro-law enforcement candidate since the campaign trail. Some advocates worry that he is not adequately concerned, though, with police abuses and those killed by police. Some cities in recent years, including Ferguson, Mo., Baltimore and Charlotte, have seen protests and violence erupt after incidents of black men being killed at the hands of law enforcement officers. The Justice Department under President Barack Obama sent mediators to those cities to try to keep the peace. The Obama administration also aggressively investigated the police with systemic reviews of entire departments to address the root cause of conflict between law enforcement and residents. Neither Trump nor his attorney general mentioned such investigations at the swearing-in ceremony. On the White House website, the Trump administration has hinted at a crackdown on protests. “Our job is not to make life more comfortable for the rioter, the looter, or the violent disrupter,” the site says. Sessions, though, did note another issue of importance to him: immigration. That is significant, as the Justice Department is in the midst of a heated court battle to defend Trump’s now-frozen executive order barring refugees and citizens of seven Muslim-majority countries from entering the U.S. This post was updated after the full text of the executive orders was released. (c) pursue appropriate legislation, consistent with the Constitution's regime of limited and enumerated Federal powers, that will define new Federal crimes, and increase penalties for existing Federal crimes, in order to prevent violence against Federal, State, tribal, and local law enforcement officers. Sec. 2. Task Force. (a) In furtherance of the policy described in section 1 of this order, I hereby direct the Attorney General to establish, and to appoint or designate an individual or individuals to chair, a Task Force on Crime Reduction and Public Safety (Task Force). The Attorney General shall, to the extent permitted by law, provide administrative support and funding for the Task Force. Группа из шести сенаторов, включая влиятельного республиканца Маккейна, внесла на рассмотрение конгресса США законопроект, который свяжет Дональду Трампу руки, если он решится на снятие санкций с Москвы. Trump VS Nordstrom: Do US president's tweets raise ethical concerns? Как сообщил официальный представитель Минобороны России генерал-майор Игорь Конашенков, ни одного случая нанесения ударов по сирийской оппозиции в провинции Идлиб с использованием комплексов "Точка-У" Россия и Турция не зафиксировали. The main suspect in last week’s machete attack on four soldiers at the Louvre Museum in Paris told authorities he had acted alone, sources close to the investigation said on Wednesday.